Recent advances in AI are transforming how we combat fraud and abuse and implement new security protections. These advances are critical to meeting our users’ expectations and keeping increasingly sophisticated attackers at bay, but they come with brand new challenges as well. This week at RSA, we explored the intersection between AI, anti-abuse, and security in two talks. Our first talk provided a concise overview of how we apply AI to fraud and abuse problems. The talk started by detailing the fundamental reasons why AI is key to building defenses that keep up with user expectations and combat increasingly sophisticated attacks. It then delved into the top 10 anti-abuse specific challenges encountered while applying AI to abuse fighting and how to overcome them. Check out the infographic at the end of the post for a quick overview of the challenges we covered during the talk. Our second talk looked at attacks on ML models themselves and the ongoing effort to develop new defenses. It covered attackers’ attempts to recover private training data, to introduce examples into the training set of a machine learning model to cause it to learn incorrect behaviors, to modify the input that a machine learning model receives at classification time to cause it to make a mistake, and more. Our talk also looked at various defense solutions, including differential privacy, which provides a rigorous theoretical framework for preventing attackers from recovering private training data. Hopefully you were to able to join us at RSA! But if not, here is re-recording and the slides of our first talk on applying AI to abuse-prevention, along with the slides from our second talk about protecting ML models. The first step of almost every connection on the internet is a DNS query. A client, such as a smartphone, typically uses a DNS server provided by the Wi-Fi or cellular network. The client asks this DNS server to convert a domain name, like www.google.com, into an IP address, like 2607:f8b0:4006:80e::2004. Once the client has the IP address, it can connect to its intended destination. When the DNS protocol was designed in the 1980s, the internet was a much smaller, simpler place. For the past few years, the Internet Engineering Task Force (IETF) has worked to define a new DNS protocol that provides users with the latest protections for security and privacy. The protocol is called "DNS over TLS" (standardized as RFC 7858). 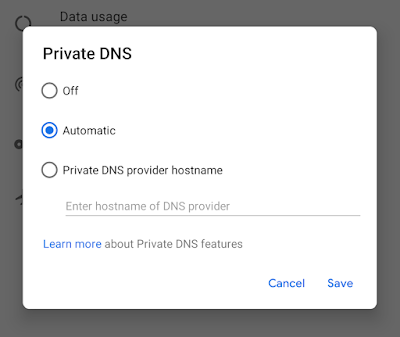 The Android P Developer Preview includes built-in support for DNS over TLS. We added a Private DNS mode to the Network & internet settings. By default, devices automatically upgrade to DNS over TLS if a network's DNS server supports it. But users who don't want to use DNS over TLS can turn it off. With the Android P Developer Preview, we're proud to present built-in support for DNS over TLS. In the future, we hope that all operating systems will include secure transports for DNS, to provide better protection and privacy for all users on every new connection. Android is committed to keeping users, their devices, and their data safe. One of the ways that we keep data safe is by protecting all data that enters or leaves an Android device with Transport Layer Security (TLS) in transit. As we announced in our Android P developer preview, we're further improving these protections by preventing apps that target Android P from allowing unencrypted connections by default. This follows a variety of changes we've made over the years to better protect Android users. To prevent accidental unencrypted connections, we introduced the android:usesCleartextTraffic manifest attribute in Android Marshmallow. In Android Nougat, we extended that attribute by creating the Network Security Config feature, which allows apps to indicate that they do not intend to send network traffic without encryption. In Android Nougat and Oreo, we still allowed cleartext connections. If your app uses TLS for all connections then you have nothing to do. If not, update your app to use TLS to encrypt all connections. If you still need to make cleartext connections, keep reading for some best practices. Why should I use TLS? Android considers all networks potentially hostile and so encrypting traffic should be used at all times, for all connections. Mobile devices are especially at risk because they regularly connect to many different networks, such as the Wi-Fi at a coffee shop. All traffic should be encrypted, regardless of content, as any unencrypted connections can be used to inject content, increase attack surface for potentially vulnerable client code, or track the user. For more information, see our past blog post and Developer Summit talk. How do I use TLS in my app? Once your server supports TLS, simply change the URLs in your app and server responses from http:// to https://. Your HTTP stack handles the TLS handshake without any more work. If you are making sockets yourself, use an SSLSocketFactory instead of a SocketFactory. Take extra care to use the socket correctly as SSLSocket doesn't perform hostname verification. Your app needs to do its own hostname verification, preferably by calling getDefaultHostnameVerifier() with the expected hostname. Further, beware that HostnameVerifier.verify() doesn't throw an exception on error but instead returns a boolean result that you must explicitly check. While you should use TLS for all connections, it's possibly that you need to use cleartext traffic for legacy reasons, such as connecting to some servers. To do this, change your app's network security config to allow those connections. We've included a couple example configurations. See the network security config documentation for a bit more help. If your app supports opening arbitrary content from URLs over insecure connections, you should disable cleartext connections to your own services while supporting cleartext connections to arbitrary hosts. Keep in mind that you should be cautious about the data received over insecure connections as it could have been tampered with in transit. How do I update my library? If your library directly creates secure/insecure connections, make sure that it honors the app's cleartext settings by checking isCleartextTrafficPermitted before opening any cleartext connection.